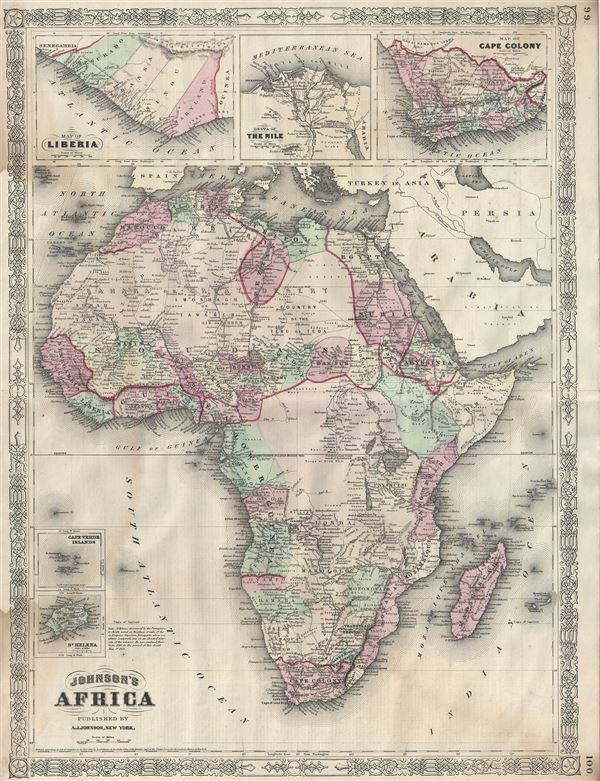 This is a beautiful example of A. J. Johnson's highly decorative 1864 map of Africa. It covers the entire African continent as well as adjacent parts of Arabia and the Mediterranean. Throughout, Johnson identifies various cities, towns, rivers and assortment of additional topographical details. Johnson introduced this map in 1864 to replace the more primitive Colton mapping of Africa used in his earlier atlases. This map accommodates recent discoveries and explorations in Africa. It is among one of the first of Johnson's Africa series to accurately represent Lake Victoria and Mt. Kilimanjaro. Three insets near the top margin detail Liberia, the Nile Delta and Cape Colony. The map features the fretwork style border common to Johnson's atlas work from 1863 to 1869. This map was published by A. J. Johnson as plate nos. 99 and 100 in the 1866 edition of his New Illustrated Family Atlas of the World. Very good. Minor wear along original centerfold. Minor spotting at places. Water stains near left margin.